Last week, Sarah and I were BEYOND excited to finally get to announce that our wallpaper Piedmont debuted with Hygge & West. We are so ready to see some of our little flora and fauna make it into people’s homes. I thought you might want to hear a little bit about the process. 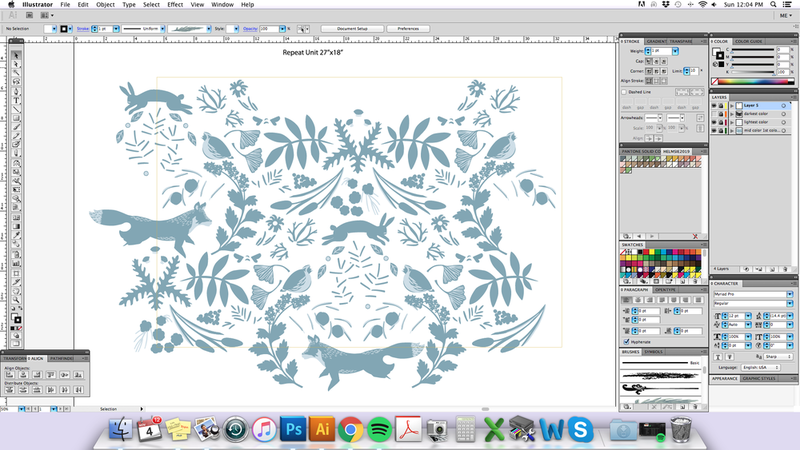 Let’s start at the very beginning, designing The Hunt fine art print. Boy-friendly designs are not easy for me to create. I love a good floral; flowers are probably 90% of what I draw and paint. Beyond liking the prettiness and daintiness of flowers, I am just a feminine person. I like bow details and pink velvet, tiny buttons and vintage dresses. Somehow it is hugely evident in my delicate drawing style. I really struggled with our first boy prints, but finally felt like I had hit a good stride when I designed The Hunt print. 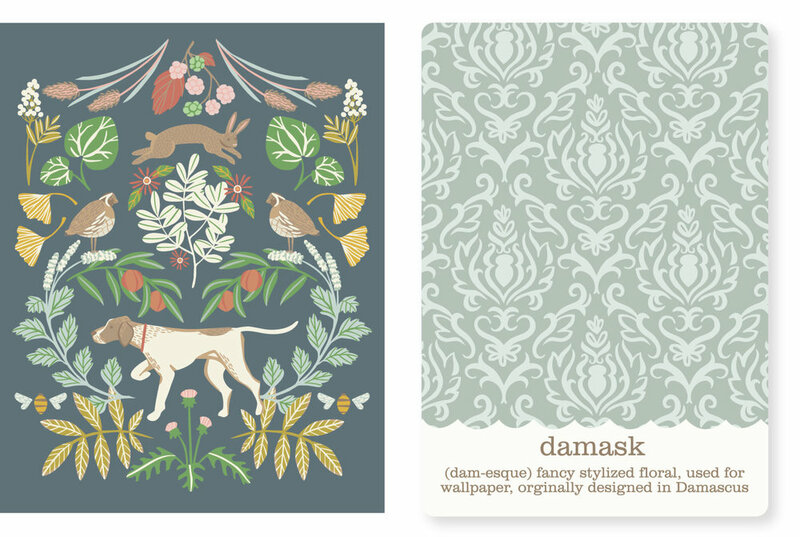 I started with the dog, and loved the idea of the story of a hunt going on in a pattern-like mirrored layout, similar to this damask from our pattern card set. After years of designing primary in repeat, I think my brain just kind of lives in that space now. The Hunt became our most popular print, and Sarah and I were so pleased. It was a confirmation of sorts for us because all along we had been determined to design fun and different boy prints. I must not be the only designer who struggles with it, because it is definitely harder for boy mamas to find things they love. We were really glad to see that we were on the right track as far as our audience was wanting. When we were at the home and gift show in January at the Americas Mart, several people mentioned that they wanted The Hunt in a wallpaper, which was very flattering to hear. Most notably for us was Nan of Firefly, a Thomasville, GA store I have loved online for years. Her taste is so fantastic, and it really was such a treat to hear she loved something Helmsie produced. So many people are quick to give suggestions when you are making your own products, and I love that, but it is hard to know what to pursue next. We only have so much time and capital to invest in Helmsie goods. With Nan’s wholehearted encouragement though, we thought that maybe it was time to contact the ladies at Hygge & West! Aimee and Christiana were so great to work with years ago when I designed a wallpaper collection with them. 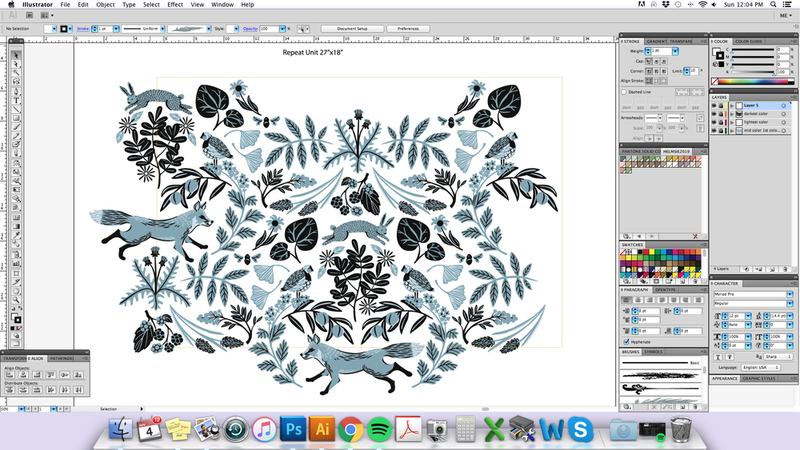 They loved the The Hunt inspired pattern I sent over, which was basically just the motif from the fine art print repeated out. They did want to see a few other options besides the dog, which we were completely on board with. I sent them a deer and a fox option. Both animals took a look time for me to get looking friendly, but not too cute, with just the right amount of personality. I wanted this to be adult and kid friendly, not too manly or feminine. Who knows what I ended up with exactly, but that is what I was going for at least. After they choose a fox, all that was left was deciding colorways. Aimee and Christiana let us do 4 of them (yay!) and we all seemed to be on the same page, as far as liking classic colors inspired by the woods. They had the specific idea for the Mist colorway which I absolutely love, and would not have dreamt up otherwise! Here it is on the call-out sheet, product spec sheet, whatever you like to call it. Being a product designer of any sort, especially my past lives as a home and gift designer (mugs, textiles, rugs etc) means you make a lot of these, in case you’ve ever wondered. After that are actual iphone images of what I was texting Sarah while we tried to decide what colors to choose. I wish we lived in the same city! We are so pleased to introduce our newest design,and first licensing partnership, Piedmont wallpaper for Hygge & West! We are THRILLED Y’ALL! We want to wallpaper every room of our houses. We hope you like it. Let us know what you think! See all FOUR colorways at H&W’s site, and that is where it is availableto purchase too. Check back Wednesday for a behind-the-scenes look at the process of creating the design.